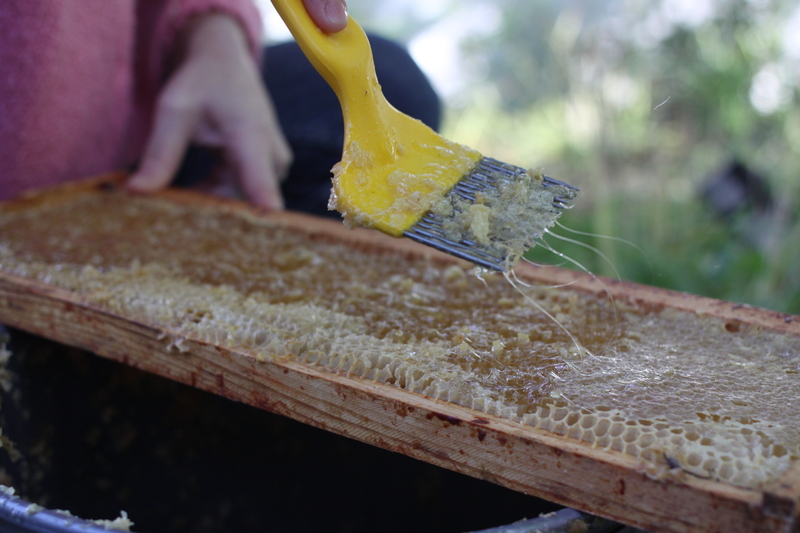 Extracting honey is a sticky, messy job. The first step is to scrape the cappings off the wax so the honey is free to flow when the frames are spun in the extractor. This can be done with a knife or, as above, with a scratching fork. I’ve done it both ways, and find the fork to be the better tool. It’s more precise, allowing me to leave more honey on the frame. I’m also a lot less likely to stab myself with it when trying to maneuver with my wax and honey and propolis-covered hands. When the frames are spun, the honey collects in the bottom of the extractor tub. We position a double strainer beneath the tub, open the gate, and do our best to keep our tongues out of resulting stream of honey. Fingers are another story.